Why the 16.9 Cu Ft. Frigidaire FFFH17F6QW is highly rated. The Frigidaire FFFH17F6QW upright freezer is a runaway favorite for medium size families for many reasons. First, it provides storage capacity of 16.9 cu ft. which is enough to meet the storage needs of a medium size family. 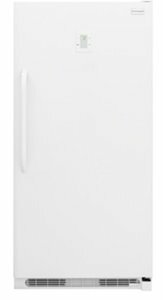 (If you are looking for a larger upright freezer, be sure to check out the Frigidaire FFFH21F6QW which has a capacity of 20.5 cu. ft.). And because it’s an upright freezer, it has a much smaller footprint and so will not take up your premium space, as a chest freezer would. This freezer is also free-standing, which means you can place it just about anywhere in your home that's convenient for you. The low maintenance that comes with the frost free design is a huge benefit for busy lifestyles, too. The 16.9 cu. ft. size makes it more versatile and easy to work with in your home. It’s perfect for most kitchens, including those that are a little on the smaller size. You can also stash this freezer in a laundry, basement, a garage, or a utility room. Is Food Organization Important to You? This freezer comes with the patented Frigidaire's Spacewise(R) organization system which is a great, proven tool for quickly storing and retrieving your food. The bins are spacious and easy to move around, and they come with color-coded clips, allowing you to designate each bin for something specific. The shelves are adjustable, which is a great benefit when you need to store oddly shaped items. You can, for example, color code individual bins for meat, dairy, veggies, summer fruits or use the color clips to arrange food according to the purchase dates or organize weekly meal plans. Certainly, life is just a little easier when you don't need to worry about finding things in your freezer! 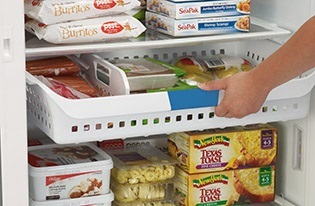 With the easily adjustable shelves and bins, you won't spend any more time feeling like you're on an arctic expedition, digging in the back of your freezer for just the right thing to cook for dinner. You also won't have to worry about coming across those ancient ice-blocks of used-to-be-food that you can't even identify anymore. Lamb? Beef? Veggie burgers? Absolutely no clue! Everything is easy to see, and get to, helping you minimize your time in the kitchen before moving on to the other important things in your life. Pizza lovers will be pleased to learn that this freezer comes with a retractable pizza shelf. With this freezer, you'll enjoy the benefits of the soft-freeze zone. It stays just a little warmer than the rest of the freezer, so you can store things like ice cream and frozen yoghurt and have them ready to eat when you are. This is much better than getting them out and pacing the kitchen floor while they take their sweet time to thaw on the counter. Who wants to wait for dessert like that ever again? The good news is that nobody ever has to. If the power goes out, there's no need to panic. Frigidaire's Arcticlock (TM) technology which evident in the upright freezer’s thick walls can keep the food in your freezer well-frozen for up to 2 days. Just be sure you don't open your Frigidaire FFFH17F6QW, and when the power comes back on, you'll likely find that the freezer has saved you hundreds of dollars in food that you could have spoiled. The FFFH17F6QW model is one of the Frigidaire frost free upright freezers. So you don't have to spend another Saturday night defrosting your freezer! Surely you have better things to do than to crouch down to remove ice from the inside of your freezer. Boring, right? Well, with this model, you won't ever have worry about manually defrosting this freezer. It defrosts automatically, so you won't get any messy, ice build-up in the first place. The freezer is designed, engineered and assembled in the USA. So expect great things when it comes to innovation, accessibility, and ease of use. Frigidaire knows you have high standards. It does, too. The Frigidaire FFFH17F6QW is Energy Efficient! So you can keep your electric bills low and still have all the frozen food storage you want. In fact, this freezer uses 431 kWh of energy each year. This works out to a yearly operating cost of about $47.80. That’s less than $4.00 each month! So no more panic attacks at the mere sight of the electric bill in the mailbox. 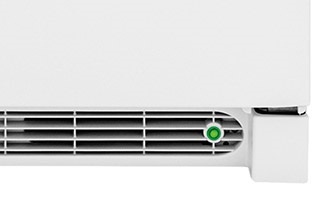 The indicator light is the radiant green light on the exterior of the freezer. It takes the guesswork out of knowing for sure whether your freezer is working. After all, you can tell at a glance whether it's on and working. If it sadly isn’t, you can immediately take measures to save your food. There's a lock on the freezer, and the key is designed to pop out when you lock this Frigidaire upright freezer. That way, you won't forget and leave the key in the lock. Just remember to keep it somewhere that’s safe and out of the reach of petty thieves. Keeping the key away also ensures that it won’t get lost or hit the floor and get kicked under the freezer. Using the key regularly is also a great way to childproof the freezer, and keep the little ones out of harm’s way. The temperature is adjustable, so you can set and adjust it on a whim. While to some people, the food isn’t quite frozen until it feels like bricks, some prefer it a little mellower. Either way, Frigidaire’s got you covered. A major advantage that digital controls have over analog ones is that temperature can be set with precision. Plus, you can see the temperature displayed on the control panel when you walk by, so you know if your freezer is as cold as you want it to be, or if you need to adjust it. What’s more, the control panel can alert you if the alarm system has sensed that something is amiss. That way, you'll know right away if there's a problem with the freezer, so you can take steps to protect your frozen food (and save the money that bought it!). With Frigidaire's reliability, though, it's hardly something to worry about. The Frigidaire FFFH17F6QW freezer is fitted with LED lights. This is a wise decision for many reasons. First, LED bulbs are far brighter than the incandescent ones. So they will help you find everything you're looking for quickly, so you don't waste any time when you're getting ready to prepare a meal. Second, LED bulbs consume up to 90% less power than incandescent bulbs, and complement the freezer’s energy efficient design by keeping a tight rein on the electric bill. Third, LED lights have a long lifespan which translates into significant savings in maintenance and replacement costs over the life of this upright freezer. Ready to Enjoy a Reliable Freezer’s Benefits? Frigidaire's appliances are built to last. And they are stunning, too. If you have any doubt, check out this upright freezer’s color-coordinated handle. Oozes style, doesn’t it? Durability and beauty are some of the 2 reasons past customers select Frigidaire appliances when it’s time for an upgrade. This freezer won't, of course, magically fix your life. But it sure will make your kitchen look great. It will also help you take advantage of deals at the store. There you can stock up on all kinds of frozen foods (and treats!) at unbelievable discounts.